This week, Stephen Ibaraki has an exclusive interview with Vint Cerf. 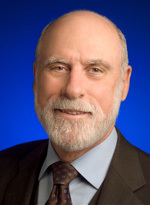 Vinton G. Cerf is Vice President and Chief Internet Evangelist for Google. He contributes to global policy development and continued spread of the Internet. Widely known as one of the "Fathers of the Internet," Cerf is the co-designer of the TCP/IP protocols and the architecture of the Internet. He has served in executive positions at MCI, the Corporation for National Research Initiatives, the Defense Advanced Research Projects Agency and on the faculty of Stanford University. Vint Cerf served as Chairman of the Board of the Internet Corporation for Assigned Names and Numbers (ICANN) from 2000-2007 and has been a Visiting Scientist at the Jet Propulsion Laboratory since 1998. Cerf served as Founding President of the Internet Society (ISOC) from 1992-1995. Cerf is a Fellow of the IEEE, ACM, and American Association for the Advancement of Science, the American Academy of Arts and Sciences, the International Engineering Consortium, the Computer History Museum, the British Computer Society, the Worshipful Company of Information Technologists and a member of the National Academy of Engineering. He currently serves as Past President of the Association for Computing Machinery, Chairman of the American Registry for Internet Numbers (ARIN), Chairman of StopBadWare, and recently completed his term as Chairman of the Visiting Committee on Advanced Technology for the US National Institute of Standards and Technology. President Obama appointed him to the National Science Board in 2012. Cerf is a recipient of numerous awards and commendations in connection with his work on the Internet, including the US Presidential Medal of Freedom, US National Medal of Technology, the Queen Elizabeth Prize for Engineering, the Prince of Asturias Award, the Tunisian National Medal of Science, the Japan Prize, the Charles Stark Draper award, the ACM Turing Award, Officer of the Legion d'Honneur and 21 honorary degrees. In December 1994, People magazine identified Cerf as one of that year's "25 Most Intriguing People." :00:15: Vint, your outstanding, lasting global contributions in innovation and executive leadership have significant impact on many generations. Thank you for sharing your considerable expertise, deep accumulated insights and wisdom with our audience. "....Always glad to be of service, pretending for a moment that this is actually of service, but we'll find out by the end of the interview...."
:00:30: You have many recognitions throughout your career, are there any that stand out to you and why? "....Let me pick on a few primarily thematically for their geographic dispersions....The Presidential Medal of Freedom meant a lot to me because it's the highest civilian recognition you can get here in the United States and the National Medal of Technology, similarly it's not awarded to a great many different people and that's another Presidentially awarded thing....The Queen Elizabeth Prize for Engineering is especially satisfying for two reasons, first you get a chance to meet Queen Elizabeth face-to-face....but on top of that a prize for engineering (as opposed to science for example, or mathematics or something of those sorts), that was especially gratifying because engineers often don't get a lot of visibility....The Prince of Asturias Award comes from Spain....The Japan Prize, this one is awarded in a ceremony with the Emperor and the Empress of Japan....These are all striking and stunning and unexpected honours (among many others), and their diversity in their geographic span I think tells you that the internet has touched many people in many places...."
:02:46: You are the immediate Past President of the Association for Computing Machinery (ACM). There are many international societies which have fairly big memberships and ACM is one of them. There are some estimates of maybe fifty or perhaps a hundred million people working in technology in some way (especially in computing); how can the ACM address some of the challenges they are facing? In addition, how can the ACM continue to grow, be inclusive and meet the needs of the global community? "....There are several challenges that ACM and others of its ilk face, one of them is establishing business models that will work in the twenty-first century. It's very clear that online publications and open access become extremely important themes and subject to debate, because the business models that go with them are not yet fully established and so there is a big issue there....There's also a question of being relevant to practitioners. Historically ACM has been made up of people (the membership anyway), who are conducting research in the space of computer science and its application, but it's the people who actually write code that gets used by others who are building businesses and building applications that we would like to reach, and in fact we suspect we do reach a great many of them but they don't choose to become members because maybe they don't have to. They may manage to get to our conferences, they may have access to our publications through libraries, so reaching the practitioners may actually turn out to be our biggest challenge - and we think there are millions of them compared to the hundred thousand or so official members that we have at ACM....And finally (not to suggest that there are only three challenges, these are just three that I'm picking up in particular), the promotion of computer science as a discipline. What we would like is to get younger people more interested in computer science. I'd like everybody graduating from high school to have at least some exposure to programming, not because I think they should all become programmers, but because I want them to all understand the world that they are living in and that that world is filled with software...."
:06:48: The ACM is involved in many areas and domains of computing and you are essentially one of the founders of the internet (the original internet). What do you see as some of the top challenges and controversies we face with the internet, especially in the next ten years, and do you have any possible solutions? "....I'm going to lump three things together as one and that's safety, security and privacy, all of which are in some sense at risk in the current, very global internet spread. The reason for that again is that software is vulnerable, it has mistakes in it, people exploit those mistakes and they use that to do all kinds of nefarious things - so we have a major challenge in front of us just to make the internet safer to use, more private and also more secure....These are essential challenges because if people don't feel safe using the internet or in particular they are not safe using the internet then it may not be around in the next 10 years, because people will have discarded it as an unsafe environment either for privacy reasons or for security reasons and confidentiality in the business context....The second one is the preservation of digital information. If we don't take steps to preserve the operating system software and the applications software we may end up with files with bits we have available, but we don't know how to interpret because we can't execute the code that knows what the bits mean. So I've been calling this a 'digital Dark Age' and I think it's literally a very real hazard. Some of us are already experiencing this problem with digital images which no longer are renderable because the software we have available doesn't know what the formats mean or how they should be presented. So that's a huge area of concern and requires some serious research.....And finally (just to pick a third area), to say that the internet of things, which is rapidly becoming a part of us, is another big issue and how to get that right. How to make sure that the devices that are part of the internet of things are safe, that they can't be abused by some nefarious third party, that they can't be invaded in some way for purposes of gathering data about you or your family. Even something as simple as a temperature sensor might be able to convey information about where people are in the house and how many of them there are, are they awake or are they asleep, so that the safety and security and confidentiality of even sensor data may turn out to be a big challenge in this internet of things...."
:11:37: In this next question, I'm going to give you a list of some areas (some of them are quite controversial), and I'd like to get your opinion on one or more of them. The first one is Kurzweil's singularity and maybe the work being done at Singularity University. The second is D-wave's quantum computing, this idea of Quantum entanglement and machine learning. There are some recent announcements in that area. The Future of Life Institute where they are talking about mitigating existential threats to humanity and deep learning impacting labour and humanity. And then some of these rapid advancements in precision genetic medicine, altering the genes of human germ cells, and then sort of this odd idea, this Ex Machina movie coming out. What are your views on these areas and what others? "....I think it's a stretch for Ray's singularity to happen, but it is conceivable that could happen, that machines could become sufficiently capable and you could somehow measure and upload your consciousness into the machine. We have some ideas but they are certainly not demonstrated at this point so I think that it's an interesting speculation....Singularity University is not solely based on that one singular speculation though, I mean it is looking at a wide range of topics. They explore a very broad range and in some cases cosmological ideas....The D-wave system is in use by Google in cooperation with NASA Ames and we've already discovered some algorithms that we believe would show the speedup that one hopes from Quantum computing....Quantum entanglement is of interest of course partly because of the way Quantum computing works, but also for the distribution of keys in Quantum cryptography environment....On machine learning I think we are learning a great deal about how Bayesian mechanisms work and we've been very successful at Google and elsewhere in applying Bayesian techniques to get machines to adapt to partial information....Although I don't know very much about The Future of Life Institute, there is another organization that a former astronaut Ed Lu started which I think is called B612. It specifically proposes to develop and deploy craft intended to detect near earth objects that might actually threaten to cross into our orbit and hit the planet....The other thing that you mentioned is deep learning, though I would add to that robotics....The last point on genetic medicine, this is complicated territory. I would say that we are learning an awful lot now about how our bodies work and what goes on inside each cell...."
:17:86: You have a remarkable career also as an executive. Are there some events or decision points that you want to share that you think may be of some value to the executives in the audience? "....I don't know if they will be of value to the executives, but I hope they will be of value to some of the younger crowd that are in fact trying to make decisions about what careers to go into and what kind of things to study, so I'll give you a few examples of decisions I made that turned out to be wrong and I was forcefully corrected...."
:21:26: You wrote an interesting piece with the ACM with regards to this whole idea of professionalism and perhaps some kind of credentialing. What are your views on that as of this year? "....It is a huge debate. Most programmers would prefer not to be told that they have to take a test to write software, and the reaction is 'I don't need no stinking test to be a programmer,' and they are probably right about that. The real question is will they be forced to accept more not only responsibility but liability for what they do? Up until now most programmers have been given a free pass with regard to their software. You often look at commercial software and it says this is not guaranteed to do anything useful. At some point we won't be able to get away with that, at least with some kinds of applications....I know that many of my colleagues don't like this idea very much, but I think with the degree of software that we're surrounded by everywhere, that at some point we may be called to task for failing to do something that protects people's interests and there may be liability, and as soon as that happens I think that some point of accreditation will be inescapable...."
:23:26: We are going to turn the tables. If you could ask yourself one question what would it be and what would be your answer? "....How many times have I been asked 'What were you thinking?' when we were doing the internet. Also they ask, 'Did you have any idea that the internet was going to be this big?' Of course the answer is, 'Well, not exactly.' Bob and I were both convinced this was really powerful technology if it worked, and we had great hopes (although I think we didn't have global aspirations in the way that you might imagine)....If there's anything truly satisfying about the experience so far I think it has to do with the way in which people have voluntarily chosen to work together to collaborate and cooperate in order to keep the internet running and continuing to evolve....If the internet is anything it is an enabler of innovation and I can't think of anything more satisfying than that...."
:25:30: Vint, with your demanding schedule, we are indeed fortunate to have you come in to do this interview. Thank you for sharing your substantial wisdom with our audience. "....It's a real pleasure Stephen, and I look forward to getting feedback if there is any from your listeners...."